According to Mike Coppinger of Ring Magazine, Gennady Golovkin is on the verge of making a massive deal with the DAZN streaming service. If true, the deal will put an end to months of speculation regarding the Kazakh middleweight. Golovkin, who is now entering his late thirties, hasn’t fought since he lost a controversial decision to Canelo Alvarez last September – the second controversial decision to keep Golovkin from earning a win over Canelo in as many fights. If the DAZN deal goes through, however, the former middleweight kingpin may very well get a chance to face his arch rival in the ring again – for Canelo now fights exclusively on DAZN himself. Feb. 16, 2016 , Los Angeles,Ca. — Boxing Superstar and Unified World Middleweight Champion Gennady GGGGolovkin, 34-0 (31KOs) and Undefeated Mandatory Challenger Dominic Lights Out Wade, 18-0 (12KOs) and their teams will take part in the UNDEFEATED Cross-Country Press Tour to formally announce their showdown set for Saturday,April 23 at the Fabulous Forum. Joining Golovkin and Wade at the Los Angeles PressConference will be Consensus #1 Pound-For-Pound Fighter and WBC Flyweight WorldChampion Roman Chocolatito Gonzalez, 44-0 (38KOs) andand his challenger, World Ranked Contender McWilliamsArroyo, 16-2 (14KOs) who will battle in the co-feature on April 23. Both bouts will be televised Live on HBO World Championship Boxing®beginning at 10:00 p.m. ET/PT. Tickets for the April 23rd event priced at $400, $300, $200,$100, $60 and $30, are now on-sale through Ticketmaster (Ticketmaster.com, 1-800-745-3000). Golovkin vs. Wade is promoted by K2 Promotions, GGGPromotions and in association with TGBPromotions. Gonzalez vs. McWilliams is presented by K2 Promotions in association with Teiken Promotions and PRBest Boxing Promotions. SOCIAL MEDIA: For moreinformation, visit www.K2Promos.com, www.GGGBoxing.com, www.TGBPromotions.com, www.FabulousForum.com and www.HBO.com/boxing. Roman Gonzalez @chocolatitobox, TomLoeffler/K2 Promotions @TomLoeffler1, TGBPromotions @TGBpromotions, the Forum @theForum and HBO Boxing @HBOBoxingand become a fan on Facebook www.facebook.com/GGGBoxing, www.facebook.com/TheForum and www.facebook.com/HBOBoxing. Use the hashtags #GolovkinWade and #GomzalezArroyoto join the conversations on social media. The reported deal will consist of at least three matches, though Golovkin may end up doubling that amount. The fighter would bring in 10 million dollars for his first fight, which would perhaps go down in the spring. Should Golovkin win that first match, and Canelo win his much anticipated May 4th bout against Daniel Jacobs, Golovkin might then make about thirty million to have a third go-round with Canelo in the autumn. Golovkin is also said to have been offered equity in DAZN should he agree to sign on with the streaming service…and the opportunity to showcase the fighters he intends to promote on the service, as well. Golovkin’s next move has been on the minds of fans and analysts for some time now. A popular fighter arguably just slightly past his prime, Golovkin brings a reputation for excitement to any company that takes him aboard due to his fan friendly style. With such outlets as Al Haymon’s Premiere Boxing Champions undoubtedly eager to have the fighter among its ranks, Golovkin has been able to pick and choose which entity he feels would be right for him. 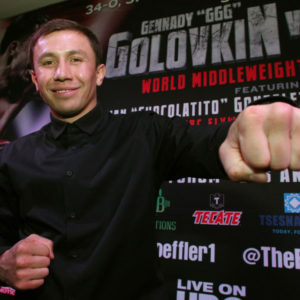 With Canelo, Demetrius Andrade, and former opponent Daniel Jacobs already with DAZN, however, the choice may well have been obvious – provided Golovkin was offered the right financial incentive to sign. The 38-1-1 fighter was one of the star attractions of HBOs boxing programming for years. HBO brass grew bored of boxing, however, and finally pulled the plug on its broadcasting of fights some months ago. Since that time, Golovkin has essentially been a free agent as far as broadcasters are concerned. Should he decide to sign with DAZN, the streaming service will clearly be the de facto home for the middleweight division.